Post-speech, the gap has narrowed. Hillary’s lead is falling. Her attack on the Alt-Right backfired. Just checked the RCP average at your behest. It’s sitting at about a 6 point margin just like it has been. Of course, the public has had only two days to react. The race will probably tighten a bit but I suspect not that much is going to change until the debates. Hillary’s attack on the Alt-Right fell flat, just as I predicted. Most Dems don’t even know what it is or what it stands for. The GOP cucks are irrelevant here. It was, however, great publicity for us! Ok, I’m a bit worried about relying on a site like Breitbart since they definitely have a dog in this fight and are likely to have a strong slant. As for the morningconsult poll, I don’t know too much about it, but I’m currently using a composite of polls to avoid being too dependent on any one source. It ranges from the LA times poll, which shows a dead heat to the Quinnipiac poll that shows Hillary 10 points ahead with an average that is right now exactly at 6 points in the lead for Clinton. If I add morniningconsult we have an average of about 5.6. If Hillary wins I don’t believe any coalition will be put together for a long time. Hillary will legalize 30 or 40 million illegals and pour in refuges by the boat loads. The Republican cucks will tighten the rules so that there will be no more Trumps. Globalist trade deals will fly right through further hollowing out the country. It will be a new era for the US. US 1.0 the founding, US 2.0 civil war, US 3.0 Hillary wins. It will be another country. If she wins it won’t be hippies burning the flag it will be people like me. But even the most snobbish SWPLs will rethink their positions when they’re forced to pay a white man tax and are afraid of getting their throats slit over their wallets when they go outside without bodyguards. The fact is a few percent whites were able to run Rhodesia for decades. 5-10% whites were able to run South Africa for a few centuries. About the same proportion to this day is able to run things in Brazil. Their current president(getting impeached) is an ethnic Bulgarian! American whites long insulated from the reality of competition between peoples are still learning, but events will force even the most grasping sociopath careerists to clamor for basic survival. Even if they gentrify entire cities for themselves, they will still find themselves under siege by hordes of the poor and desperate in an ever-shrinking green zone. I don’t disagree with anything you say but the North is the problem and they’ll do anything not to be called Redneck by the Jews. I looked at the votes and there’s too many in the North to throw them out of the country. The other states are stuck with them. Will they will drag us down until it’s too late? I’m very negative about the whole situation. I hope you’re right but due to my financial situation and age it won’t help me any. It will be too late for me and I’ll probably have to move, which I can’t afford, to keep from being murdered if there’s a financial crash. I was talking to a guy in North who was berating me about my foolish fears of minorities. He said he was so superior that he would just move to a gated community, implying my inferiority. This is fine if he thinks that but I pointed out all the row houses in Baltimore, Maryland and other cities that are being consumed by the Blacks. Here’s some. These could be great fixer up houses. People in Europe live in houses like this for hundreds of years. It’s a vast waste. Basic search there’s 16,000 Vacant Houses in Baltimore. I read a guys blog who writes about violence and lives in the ghetto in Baltimore and I think he said that it’s more like 25,000. You might like James blog. He writes books with titles like,”When Your Food”. The Northern guy doesn’t understand. How he can’t live in areas where there are hundreds of houses that with a little work could be great for young families. He doesn’t get it. The spaces are contracting. Gated communities will be surrounded and then forced to take on section 8. You can not get the threat through to these people. Living in enclaves now is status and people will do whatever it takes for status even if it means going into debt or slicing up their face to make ritual scars. 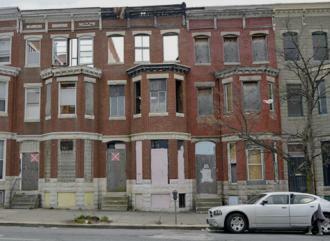 You can’t get the whole story from areas like Baltimore and Detroit that are being allowed to fall apart. You have to look cities like Washington DC and parts of New York that are actually getting whiter from the forces of gentrification. People with status don’t care what happens in Baltimore if they can afford a flat in Adams Morgan in Washington. I don’t know, they may be right that they can have just a few a cities all to themselves while everything else decays. The 3rd world is full of wealthy compounds with high walls, barbed wire fences, guards and everyday life goes on for most people. On the other hand, you have all the people who are in with the system packed into just a few neighborhoods and everyone knows where to find them. Not exactly anti-fragile.